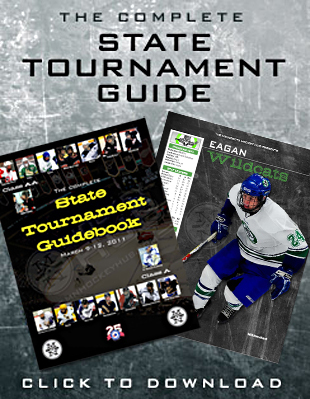 Eagan is all set up for the commonplace -- and deadly -- “just happy to be there” trip to the state tournament. The Wildcats spent an entire year prepping for one night, then turned in a performance for the ages as they beat Apple Valley 1-0 in the Section 3AA championship game. The Wildcats now find themselves in the state Class 2A tournament for the first time since 2006, Eagan’s only other appearance. No. 4-seeded Eagan (20-6-2) opens against unseeded Moorhead (18-7-2) in an 8 p.m. quarterfinal on Thursday, March 10, at the Xcel Energy Center in St. Paul. The singular-focused Wildcats, admittedly, hadn’t thought much about what they would do if they got past Apple Valley. “Yes,” Taylor said when asked about a post-section championship hangover extending all the way to St. Paul. “First give them a day to have fun with it, then we’ll give them a day off. Then we’ll crack the whip and let them know we ain’t going there just to eat at Cossetta’s. For the uninitiated, Cossetta’s is the Italian market and pizzeria just across 7th Street from the Xcel Energy Center. While the Wildcats might very well do some carbo-loading there during the tournament, Taylor’s point is well taken. Moorhead must become the new singular focus. Instead of seeing everything as Apple Valley brown, the view now becomes Moorhead orange. 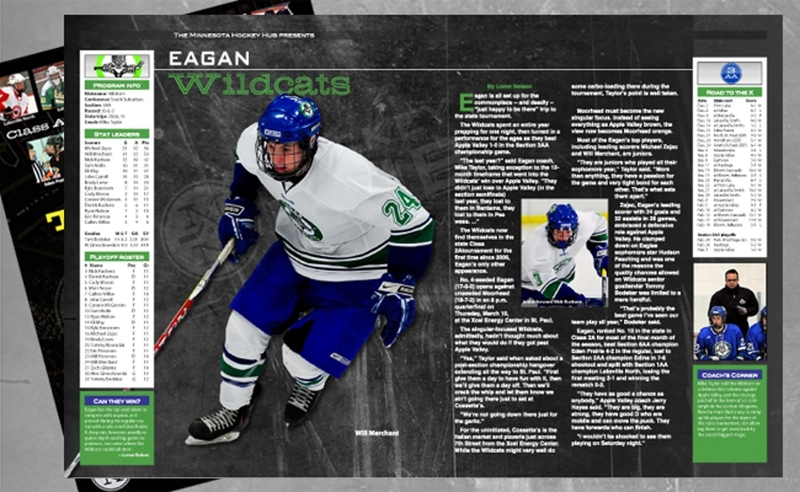 Most of the Eagan’s top players, including leading scorers Michael Zajac and Will Merchant, are juniors. 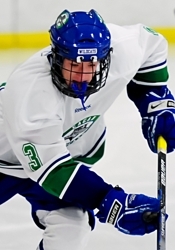 Zajac, Eagan’s leading scorer with 24 goals and 32 assists in 28 games, embraced a defensive role against Apple Valley. He clamped down on Eagles sophomore star Hudson Fasching and was one of the reasons the quality chances allowed on Wildcats senior goaltender Tommy Bodeker was limited to a mere handful. “That’s probably the best game I’ve seen our team play all year,” Bodeker said. Eagan, ranked No. 10 in the state in Class 2A for most of the final month of the season, beat Section 6AA champion Eden Prairie 4-2, lost to Section 2AA champion Edina in a 7-6 shootout and split with Section 1AA champion Lakeville North, losing the first meeting 2-1 and winning the rematch 5-2. “They have as good a chance as anybody,” Apple Valley coach Jerry Hayes said. “They are big, they are strong, they have good D who are mobile and can move the puck. They have forwards who can finish. Eagan has the top-end talent to compete with anyone, as it proved during the regular season with a win over Eden Prairie. A deep run, however, usually requires depth and big-game experience, two areas where the Wildcats could fall short. Mike Taylor sold the Wildcats on a defense-first scheme against Apple Valley, and the strategy paid off in the form of a 1-0 triumph in the section title game. Now he must find a way to ramp up his players for the rigors of the state tournament, not allowing them to get awestruck by the state’s biggest stage.